The Peak series comes standard with our most popular climbing options: rock wall, chain ladder/flat-step ladder combo, and accessory arm with rope ladder. 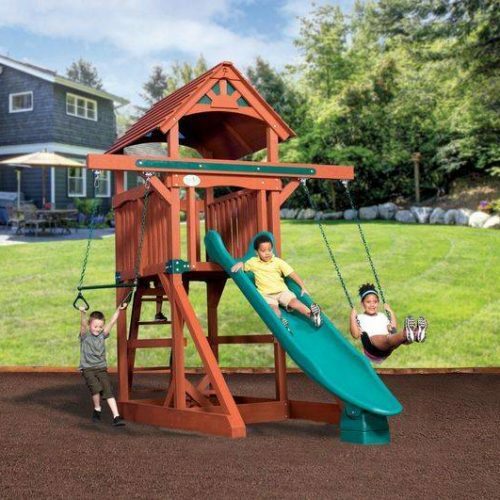 You also get a tire swivel swing and an accessory arm with trapeze bar with every Peak unit. Olympian Peak Jr 1 comes with a Tarp Roof, 3 belt swings, and a telescope. It has a 6′ high deck, a 12′ Rocket Slide, and a 9′ high swing beam. 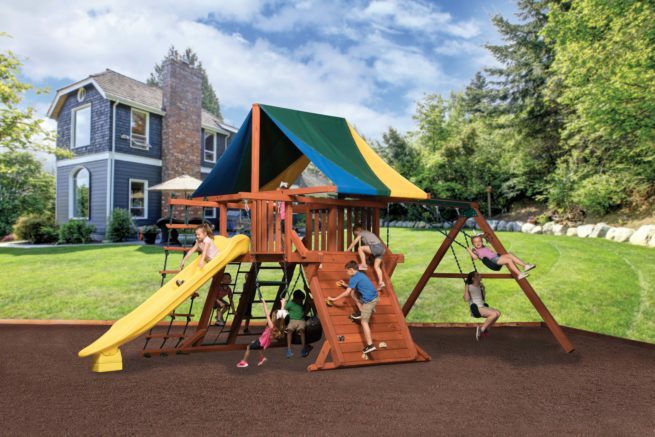 ADVENTURE PEAK models are based on a 5′ floor height, OLYMPIAN PEAK models are based on a 6′ floor height, and TITAN PEAK models are based on a 7′ floor height. 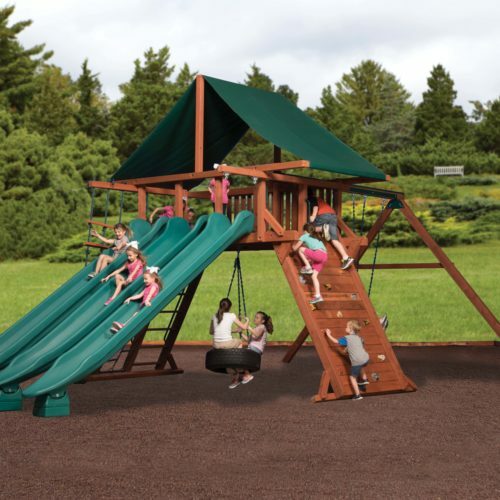 Junior Peak models accommodate 2 play activities on the front side, and Jumbo Peak models accommodate 3 play activities on the front side. The Backyard Adventures Peak Series was recently completely redesigned. We’ve taken the best of our previous angled leg systems and combined them into the Peak. 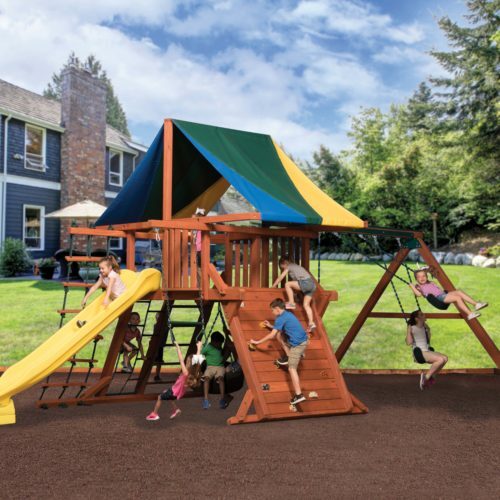 The new larger deck size is huge, and the taller head room makes this a perfect play set for you and your children. 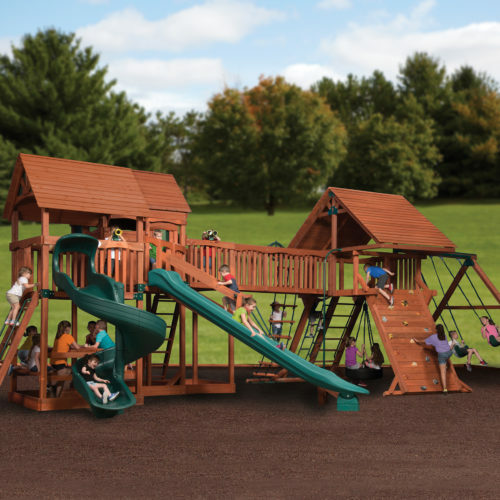 You’ll be amazed how much room you’ll have while playing in one of our Peak forts!